For 15 years I created a temporary 75-90 foot labyrinth as part of the annual Earth Day celebration for California State University in Sacramento. Each year on that day, thousands of children encountered the labyrinth. In 2011, Earth Day was moved from the university, and I was invited to collaborate with local groups in Carmichael, CA, that started an annual Day of Peace event. I've also offered labyrinth walks within both the summer and after-school programs at The Learning Tree, a school in Carmichael, CA. In these programs, I use the labyrinth to open and close the day, with students bringing along their journals to record their reflections at the end of the day. Here are some images of those walks which incorporate a 26-foot canvas labyrinth. When crafting a labyrinth event, I love to include sound, especially didgeridoo and flute music, to expand the walking and healing experience. The musician sets up a booth from which the healing sounds are offered before and after the labyrinth walk. Sometimes we even invite the musician to play the ‘pied piper,’ playing the instrument while leading the walk, and then once in the center, bathing each person in good vibrations. I also include a table where labyrinth-centered experiential activities are available. In this area people of all ages can create labyrinth rubbings and see examples of different types and uses of labyrinths. I also have a ‘lap-top’ labyrinth which can be experienced sitting down. The users place the labyrinth on their laps with a marble to roll through the paths, with or without the help of hand holding. I will be glad to share information on managing large numbers of walkers, exhibit and educational information, and experiential elements like music, ceremonial flags, and labyrinth rubbings. For more info contact Sue Anne Foster. By Rev. Sig Lonegren M. A. It is clear that labyrinths have been used for millennia as tools for rituals and ceremonies. For example, many of the Swedish Viking inland labyrinths are oriented toward the Mid-Summer Solstice Sunset. Mid Summer (St John the Baptist Day, June 24th) has long been a very important holiday in Sweden. So it comes as no surprise that the Vikings saw that as an important turning point of the year. "Solstice" means "Sun Stands Still." June 24th is the first day after the Summer Solstice (usually the 21st of June) when, if you are paying very close attention to the Sun's rising or setting point on the horizon, you can see that the sunlight is actually going away - the days are growing shorter. Likewise, on the 25th of December - at the exact opposite end of the solar year, if you have once again been paying close attention to the rising or setting sun on the horizon, you can see that the light is returning (the days are having more light than dark) - an apt reason for that day being chosen by the Church as Christ's birth. But of course, labyrinths can be used to celebrate other occasions than specific days of the solar year as well. One good way is to use the labyrinth to begin and end a longer ceremony. At the beginning, participants walk in to the goal, and cross over the in the centre of that labyrinth cross and walk out the mouth. At the end of the ceremony, they walk in and immediately step over the crossing to the goal, and then walk out the full way from the goal to the mouth. In this way, the labyrinth acts as a parentheses to enclose the beginning and end of a ceremony. Labyrinths are an excellent way to make vows at handfastings or weddings. Using a Classical Seven Circuit Labyrinth, walking one-at-a-time, on each path, one of the partners talks about how they relate to this event - on the first path (#3), what do they think about getting handfasted/married, second path (#2), how do they feel about it, third path (#1), what are the physical realities of this union?, fourth path (#4), what are the spiritual ramifications?, fifth path (#7), invoke your Deity of Choice, sixth path (#6), what is your vision for this union?, seventh path (#5), what is the first step you need to take to achieve this vision?, and then the goal, where you await your partner who goes through the same steps. Then the reverse is played out, where the results of this vision and first step are spoken of in terms of their spiritual, physical, emotional and mental ramifications. It is not necessary for the couple to remember the tasks on each of the paths. Someone else can state them as they begin each path. Also, it is much better not to plan what you're going to say on each path in advance. Allow the magic to happen! There are as many possible ceremonial uses as there are labyrinths and people using them, but one more wonderful use of them is the Appleton - a dance that has been done at numerous TLS Gatherings. It was invented/discovered by long-time TLS presenter Jon Appleton, and is a way of getting lots of people starting in two rows to dance the seven circuit in such a way that, IF DONE CORRECTLY, one continues to meet and dance with their partner going in and coming out again and again. (Instructions are described on this page of the Mid-Atlantic Geomancy Website. Ultimately, for me, the labyrinth is the stirring pattern for that old Celtic Goddess Cerridwen's great cauldron. It is a way of stirring up the energies to create a truly magical event. We walk the labyrinth path in stone rings here in the UK for this purpose, and it can be walked in fields and in snow as well to wind up the energies. On the Labyrinth Society Global Group on Facebook we discuss more Ritual and Ceremonial uses. Please check it out, and add your own mixture to this wonderful spiritual brew. By the Rev. Jill K. H. Geoffrion, Ph.D.
A church labyrinth can support and enhance the life of a congregation and its mission in many different ways. A labyrinth can be a wonderful outreach and hospitality tool that communicates the warm, open spirit of a church. Having a labyrinth that is available to the larger community is a wonderful way of welcoming the public onto the church property or into the building. Sharing this sacred tool communicates the congregation’s interest in the spiritual health of its members and neighborhood. One church close to a community college welcomes students, staff, faculty and administrators to its labyrinth each month through a partnership with the Office of Campus Ministry at the college. Professors of religious studies and history classes bring students to introduce them to the labyrinth as well. The possibilities of labyrinth programming are as varied as the imaginations of church members. For instance, labyrinths have been used effectively as extensions of a congregation’s prayer ministry during a 24-hour fast for world hunger. 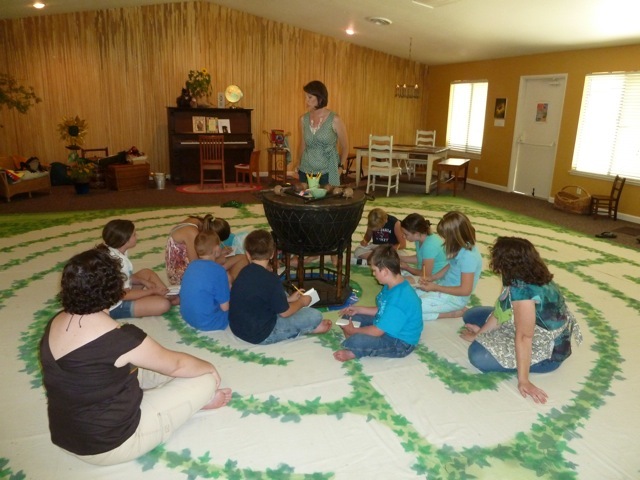 Sunday school classes of adults, youth and children all enjoy using the labyrinth as they move while considering what they are studying and its applications. During different liturgical seasons and feast days, special labyrinth events support the spiritual health of all those who come. Labyrinths have been used effectively during weddings, funerals, and baptisms. Youth group members in a confirmation class at one church enjoy walking the labyrinth as they discern their next steps of faith. Congregational leaders successfully use their labyrinths for discernment, conflict resolution, and celebration. One pastor prays a labyrinth each week before starting her sermon preparation. A ruling board that had reached an impasse walked the labyrinth together as a way of inviting each person to look at a situation from a new perspective. Afterwards, they found they could continue the discussion that had been stalled. When a project is completed, committee members at one church walk the labyrinth together while talking about the meanings of the work they have done. The labyrinth is a tremendous resource for pastoral care ministries. Members at churches with labyrinths often speak of walking to find inner healing and bringing others to the labyrinth for this purpose. Whether encouraging engaged couples to use the labyrinth as they consider what it will mean to walk together in life, offering special labyrinth events during periods of congregational, community or international crisis, or encouraging individuals to pray the labyrinth on behalf of those in need, congregations find that having a labyrinth allows them to enhance their ministries of outreach and love. Members of churches with labyrinths express gratitude for the opportunity to engage in this form of prayer on a regular basis. They report their faith deepening as they use the spiritual discipline of labyrinth walking over time. Opportunities to introduce others to the labyrinth ministry of their church seem to flow naturally and fruitfully. Requests for a congregational labyrinth often are initiated by a church member who has had a meaningful experience while praying a labyrinth. 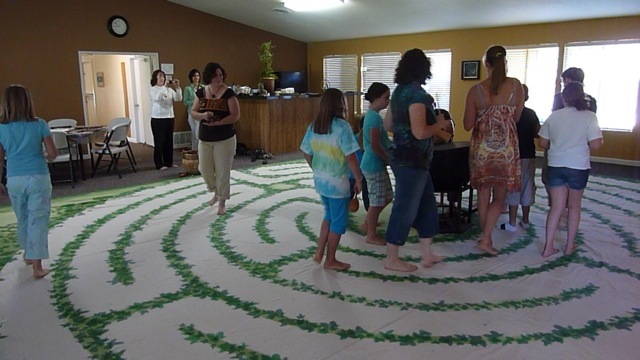 Rather than explaining the labyrinth to those who have the power to decide about how the congregation might initiate a labyrinth ministry, take these people to a local labyrinth and facilitate a labyrinth experience. When a committed group oversees the purchase or installation of a labyrinth the church’s ministry has the potential to thrive and grow. Having a plan for maintenance of the labyrinth is crucial to long-term success of any labyrinth ministry. Prepared for The Labyrinth Society Web-page by the Rev. Jill K. H. Geoffrion, Ph.D., author of seven books including Christian Prayer and Labyrinths. Visit the Jill Geoffrion Website for more information. Neal Harris, MA, LCPC, DAPA shares his experience in working with labyrinths in his counseling practice. Looking back on over a decade of using labyrinths in counseling, all indications point to the powerful role they can play in facilitating the therapy process. I use a finger labyrinth in counseling at the same time as my clients do in order to promote relaxation and the resulting increase in awareness on both our parts. The finger labyrinth helps me be a better listener and helps take a newer client’s attention away from the typical reluctance around talking about their issues. Moving a finger through an inlaid wood path (with eyes open or closed) allows both of us to relax and focus. When this happens, clients become much more aware of their own issues and the blind spots that tend to keep troubling patterns locked in both mind and body. The therapist, in turn becomes more capable of being “tuned in” intuitively to the client’s process and able to facilitate change more readily. The use of finger labyrinths also helps break down the “professional barrier” that we as therapists are taught (in graduate schools throughout the country) to put solidly in place and keep sacred. By keeping that barrier in place, clients are kept from feeling on an equal footing with their therapists and therapists therefore can maintain the mental illusion that they don’t have any of the problems their clients are having difficulty with. This separation or hierarchy between client and therapist, in my experience, puts the therapist on a pedestal in the client’s eyes, which down the road has great potential for dependence on the therapist, which can lead at best to long-term therapy and at worst to an abuse of power (consciously or unconsciously) on the therapist’s part. In my practice, I opt to create a healthy footing between myself and my clients by letting my clients know up front that he or she has strengths and weaknesses and I do as well. I model this when I work with a finger labyrinth right alongside them. In this more equal environment, the barriers to effective communication tend to break down, which leads to mutual trust. It has been my experience that rather than hope that trust builds over time (sometimes months or years) finger labyrinth usage tends to speed up this process significantly as the barrier to trust and effective communication (through establishing this hierarchy) is not raised and fortified in the first place. With the emergence of managed care insurance guidelines in the counseling field, clients are allotted a certain number of sessions to “get better” (usually somewhere between 8-12) and those counseling sessions are paid for by insurance. If clients need more than 8-12 sessions, they must pay for their own therapy or have the therapist petition the insurance company for more sessions. This, in my opinion, makes the use of finger labyrinths that much more valuable, especially to those counselors who are directly tied to managed care for their financial survival. In my experience, finger labyrinths in conjunction with conventional talking therapies tend to foster issue resolution in a speedier timeframe. I believe (on a more mysterious level) it is also incredibly important to acknowledge the unseen forces that are present in the therapy room (to assist with the unfolding of issues and the therapeutic process). The use of finger labyrinths helps both client and therapist tune into these forces (via the relaxation the pathways afford) to receive the “aha” answers to problems both are carrying with them into the therapeutic relationship. I proceeded to ask her basic questions about her life and family and found that I was getting one or two-word answers. I decided to try using an Intuipath® with her (a mirror-image, 2-person, 2-handed, double wooden finger labyrinth design). After a few sessions, we addressed her low self-esteem and the way her alcoholic father contributed to its formation by discounting everything she said as a child, even in public. This subjugation to her father’s will (and to a degree, her mother’s as well) continued into adulthood on her yearly visits to Scotland. Using the double labyrinth (around the fourth session), she spontaneously verbalized the negative affirmation “I am a weak and uninteresting person.” We fingerwalked a bit more after that, and I asked her to “allow” a positive affirmation to make itself present to her conscious mind. What presented itself was “I am competent in all social situations.” I asked her to say this out loud and see how it sounded. She said it quietly, with a slight crack in her voice. I suspected (because of the difficulty she had in saying this statement with decisiveness and gusto) that we had hit upon some early, negative self-statement that was replaying itself in all of her social interactions, causing her to feel weak, uninteresting, and therefore socially inept. I asked her to take several deep breaths and after each, say the positive version again loudly like she meant it. She did so, and her voice became stronger after each utterance of it. Between sessions, as she was instructed to do, she used this positive affirmation throughout each day, and when she returned to session (after a several-week hiatus which allowed her to return to Scotland for her yearly visit), she reported great changes had taken place in her courage and competence in social situations. She even reported that her relationship with her father shifted to a more satisfying and equal emotional footing. In total, I saw Clara for 12 sessions, and her improvement in self-esteem was maintained as reported by her in a six-month, one-year and two-year follow up. Utilizing the power and grace of her own intuition and wisdom (elicited in large part through the use of the Intuipath® design), Clara was able to marshal new strength and understanding, and as a result, rapidly change her adaptive responses to gain greater satisfaction and meaning. With her newfound self-esteem and confidence, she was able to gain a sense of clarity and mastery over other issues as well. While finger labyrinths are a terrific catalyst to most therapeutic issues, some clients will refuse to try them. For instance, those who’ve been brought up in a religion or belief system that associates the labyrinth pattern (or relaxation techniques in general), with fear and misunderstanding. Other potentially difficult situations for using finger labyrinths are with those who are actively psychotic, clinically depressed, in the manic phase of Bipolar Disorder, and those who have Borderline Personality Disorder. This doesn’t mean that you can’t use a finger labyrinth with any of these diagnostically-labeled clients. It just means that more caution should be used as each (with the use of a finger labyrinth) may come face to face with the underlying issues they’ve been trying to consciously avoid dealing with. In addition, working with finger labyrinths as part of a therapeutic strategy can also present a potential challenge to both newer and more experienced therapists. As I see it, labyrinths are an intuitive playground for the spirit. They involve intuition and a willingness to allow whatever comes up in the process of fingerwalking to surface without judgment or censorship. Therefore, therapists who think they “know” what each of their clients need and have a theoretical road map of how to get each there using his or her favorite structured therapeutic modality (i.e. Transpersonal, Humanistic, Jungian, Freudian, Cognitive-Behavioral etc.) may find using a finger labyrinth in therapy rather disorienting and sometimes a struggle at first. With experience, most therapists using finger labyrinths report clients are resolving their issues more quickly while the therapists themselves are experiencing heightened intuitive gifts and better listening skills: the cornerstones of every successful therapist. Having used walking labyrinths numerous times in therapy situations as well, it is clear that they, like finger labyrinths, can have a profound effect on both relaxation and trust. It has been my experience that walking labyrinths (especially when walked by more than one person at the same time) tend to hold up a hypothetical “mirror” in front of a client where he/she can see the truth behind any defense mechanisms made up of unproductive thoughts, attitudes, or beliefs that are held in the client’s mind. As a result, clients seem more ready to look at and potentially release, some of these defenses and go on to develop new, more satisfying strategies. A couple came to me to learn relaxation techniques to better cope with the anger and frustration they felt when dealing with authority figures. I invited each to walk the labyrinth that was on my premises. The wife did so; the husband refused to take part. After briefly discussing her experience, the couple went on their way. The following week when they returned, the wife was very excited and proceeded to talk about how “nice” those in authority positions seemed to be that week in their interactions with her. Her husband said they still treated him “just as badly.” I noticed that her face had a soft smile on it (almost an inner glow), and her body language was much more open than during the previous week. His face and body features continued to look like that of an angry man (much like hers had looked the previous week.) She said that it seemed like a miracle the way everyone was so nice to her. I suggested to her that maybe the world didn’t change, but that her expectations of the world did and that was enough for the people in authority to look at her and treat her differently. This was a very eye-opening statement for her and it immediately began to unravel long-held beliefs about how she was powerless to have positive relationships, especially with those she perceived to be in authority positions. As a result of incorporating the walking labyrinth early in the counseling process, this woman went from being angry and closed to confident and open when dealing with authority figures. Naturally, not all labyrinth experiences facilitate happy endings like the two case studies above. After all, labyrinths facilitate people’s awareness of their shadow self (the parts of our personality and experience that are perceived to be so painful, we consciously or unconsciously have chosen to hide these parts from our awareness). Using labyrinths in counseling can lead to clients coming face to face with their darker side and this shouldn’t cause the therapist to feel blame for clients temporarily feeling worse about their lives. This is a natural part of therapeutic growth, and the labyrinth experience acts as a powerful catalyst for that growth. Labyrinths have their definite place in the counseling arena. As more and more therapists across the globe are adopting the use of finger and walking labyrinths in their practices, we will be seeing an upsurge in the effectiveness of those practices and the satisfaction those clients feel for the unfolding process and issue resolution they experience. Since finding out about labyrinths 13 years ago, I have incorporated them as a large part of my counseling repertoire. Other counselors have done the same, mostly using the Intuipath® double finger labyrinth design. The labyrinth, in its many forms, has proven to be a valuable tool in the counseling room, especially when therapists hit a brick wall and need a catalyst for moving their clients toward greater balance and health. At these times, labyrinths can open new doorways to growth for both clients as well as their therapists. Neal Harris is a Licensed Clinical Professional Counselor, with a Master’s Degree in Applied Psychology, and a diplomat of the American Psychotherapy Association. He has practiced the art of psychotherapy for the past 22 years. He is also the managing director of Relax4Life, a holistic education and services center and has been a workshop leader in the holistic health and self-enrichment fields since 1985. He is a founding member of The Labyrinth Society and a Certified Veriditas Facilitator. Email Neal Harris or visit his website for labyrinth classes and Intuipath® information. Institutions are not likely to act on a suggestion such as, “Why don’t we get a labyrinth?” It is usually necessary to supply supporting information to show the many returns on investment that labyrinths have to offer. Research regarding the benefits of labyrinth walking is available on the research page of the TLS website as well as by contacting the TLS Research Chair for information. Invite the decision-makers to view the TLS DVD: Labyrinths for Our Time; Places of Refuge in a Hectic World. Provide examples of other hospitals that have labyrinths and use them effectively. Note that labyrinths are well established in other areas of business and industry. Invite decision-makers to see labyrinths as a valuable part of complementary and alternative healthcare. Show that labyrinths offer a way of being progressive that is attractive to patients and therefore good for business. Do the footwork: make a proposal, with design, cost, location, funding strategies, etc. Recruit an inside advocate: a chaplain, a nurse, or someone to help promote it; creating a committee is best. Bring a portable labyrinth or create a temporary labyrinth on site for administrators to experience first hand. Raise the funds to pay for the labyrinth, often through a non-profit auxiliary group (“Friends of . . . “). Approach the architect of the new hospital expansion and renovation, to add a labyrinth to the plan. Provide finger labyrinths for the waiting rooms. Put up informative posters with beautiful labyrinth photos. Finally, be patient. The process of getting a labyrinth into an institution or public setting can sometimes take years of education, promotion, and fund raising. Probably the most powerful and convincing argument is to show how labyrinths fit into and benefit the healing process and environment. To that end, the TLS DVD mentioned as the first suggestion above is available to support making a stand for labyrinths in a variety of community settings. Please contact Hallie Sawyers, TLS Education Outreach Chair, for more information on how to obtain a copy. In addition, the Labyrinth Enterprises website below has a list of some 200 hospitals with labyrinths as well as examples and photos. Support and networking for those interested in labyrinths is also available through attending The Labyrinth Society’s Annual Gathering, an event that provides an opportunity to meet labyrinths enthusiasts from all over the world, attend labyrinth-centered workshops and learn from labyrinth experts. The Labyrinth Society also sponsors World Labyrinth Day on the first Saturday of May. To find out when and where World Labyrinth Day events will be held, visit the Labyrinth Society Events Calendar. To find a labyrinth near you, visit our Labyrinth Locator. Prepared for The Labyrinth Society web site by Robert Ferré, labyrinth designer, builder, author, workshop leader, and event facilitator. Visit the Labyrinth Enterprises web site for more information. Providing a labyrinth in a healthcare setting can support and enhance the life of the institution and its mission in a variety of different ways. A quiet place where the simple act of walking offers a proactive way to ‘do’ something towards getting better. An inviting way of getting exercise outdoors in nature. A clearly non-medical environment where patients can share time with family and friends. A place where patients can let go of the issues related to illness and injury. A sacred spot where patients can express intentions and hopes for the future. A perfect spot for a “get well” ceremony. A reduction in the stress related to being ill, an improved attitude about coping with ill health, an interest in participating in treatment, the return of hope or the inner peace necessary to complete life’s business before dying are just a few of the responses possible for patients using the labyrinth. 1. Walking the labyrinth prior to operating or caring for patients provides a way to clear the mind and focus attention. 2. A place for healthy ‘time out’ – an alternative to a smoking break. 3. Personal space after being with many people. 4. A calm environment in which to prepare for dealing with challenging situations. 5. A place to regain balance and perspective. 6. A tremendous resource for pastoral care ministries. 1. To calm and focus themselves before meeting with doctors or seeing loved ones. 2. As an alternative to sitting in the emergency room for hours. 3. Something to do together with the patient. For the institution itself, labyrinths are good for business. They offer a cost effective means of being progressive and integrative. Demonstrating that the institution cares about the whole person, whether patient or employee. Balancing science and technology with complementary care. Providing an excellent form of outreach to the community for promoting wellness. An inviting oasis that adds unexpected beauty to a clinical environment. A perfect center in which to retreat, commune, celebrate, honor, and remember. Cost effective -- costs less than a typical piece of equipment. The center of a healing garden or outdoor space. Though the many benefits of walking a labyrinth have attracted researchers looking to quantify the effects, the power of the labyrinth comes from the invitation one receives to slow down and go within to a place where science and technology end; a place where one has access to their ‘inner healer,’ and the return to wellbeing is placed back in the hands of the one who desires to heal. I have the privilege of organizing a team of 8 adult meditators who offers Peace Club to more than 200 children, teens, and adults for those who are challenged by poverty in Chicago. Peace Club is an 8-week series of mindfulness, meditation, mandalas, labyrinths, peace circles and other contemplative practices. Peace Club is offered during the school year and at a summer day camp, at a social service center for the interns and the staff, and also by the urban farmers. The guests of the non-profit often report that mindfulness and meditation helps to relieve their stress. Labyrinths are simply walking meditations and the labyrinth is incorporated in all that is offered at Peace Club. A few examples are; mindful yoga poses are performed in the middle of the labyrinth, a small personal size labyrinth is in the middle of a circle of chairs as a visual centerpiece for the peace circles, and each group is offered a workshop where they design and create their own labyrinth to use at home. Janice Lewis is on The Labyrinth Society Board, advanced certified labyrinth guide, holds four certificates in mindfulness and meditation, trained mandala teacher, and advanced peace circle leader. You can contact her at meditation@janicetime.com. The U.S. prison population has just reached the 1% mark. With 1 out of every 100 people in the United States behind bars, prison volunteers of all kinds are more important and more needed than ever. A handful of TLS members in various parts of the country have had on-going labyrinth prison ministries for many years. Mostly the programs occur once or twice a month for a couple of hours. And mostly they are sponsored by the Chaplain or the Counseling departments. In presenting a proposal for a labyrinth program to either a Chaplain or a Counselor, it is necessary to remember that security will always be the number one concern that any decision maker has to consider. For example, while we are used to thinking that temporary labyrinths made with rope, stone or paint are easy, quick and inexpensive, you will not likely be able to get any of those things into a prison. A portable canvas labyrinth or finger labyrinths on paper will be a better option. It is important to outline the benefits of the program to the institution, which are simple. A busy inmate is a happier inmate and a happier inmate is easier to manage. Benefits for the inmates can be simple as well. The biggest may be stress reduction. Prisons are stressful places to live and work, and they are noisy and crowded. Having some quiet time, perhaps with meditative music, is often reason enough to attend a labyrinth program. Inmates may range from white collar criminals with advanced degrees to the mentally ill. Statistically, most inmates have minimal education, and many are serving sentences for drugs. They may be far from family who cannot afford to travel for a visit and often have children being raised by someone else. An unexpected “side effect” of a long standing program is that it gives the inmates a group of “labyrinth friends” with whom to socialize. If you feel called to bring the labyrinth into a prison setting, it is important to be patient as it can take months to get a new program approved. You will be expected to attend an orientation where the rules will be explained and the necessary paperwork, fingerprinting and background checks will be completed. You will need to pay attention to the rules as your program could be halted at any time for a violation of them. You may be required to undergo drug testing as well. Once you have been approved, you will need to be consistent. If you say you will be there twice a month, it is important that you keep this commitment. When planning your programs, you will need to be flexible. Your program may be canceled at the last minute, or not start on time, for a variety of reasons. Each of us who have had the privilege of sharing the labyrinth with those who are in prison have left feeling blessed, and grateful for our freedom, and believing that we have received more than we have given in the experience. For more information on labyrinth work in prison settings, TLS members are invited to post a request on the general forum and search the membership database to reach those with experience in this realm. Those who are not members of The Labyrinth Society can contact the TLS Educational Outreach Chair for more information. Labyrinths and mazes have been part of recreational life for millennia. They were used in conjunction with sophisticated games in ancient Greece on through the medieval period in Europe. Scant records exist about dances and games played in labyrinths in medieval churches and more recently in labyrinths, especially those still found in England and across Scandinavia. When formal gardens and parks arose during the Renaissance in Europe, they at times included labyrinths and mazes. Today, labyrinths are undergoing a modern revival in response to the contemporary needs of our times. As cultural enhancements to modern parks, labyrinths are flexible in their ability to meet both the contemplative and active recreational needs of park users, making them unique features that almost everyone can use and benefit from. As the centerpiece or destination point of serene settings in public parks, labyrinths are quiet oases where people can pause, step out of the frenetic pace of life, and take time to rejuvenate. While labyrinths may be new developments in modern parks, the need for contemplative spaces in community parks is well-established. People have always visited parks for rest, renewal, and introspection, but restorative environments are needed today more than ever before. Labyrinths are both contemplative tools and restorative environments that help people respond to the complexities of modern life. As design elements, labyrinths are beautiful and intricate patterns that are aesthetically pleasing. When incorporated into public spaces they revitalize or add beauty to the surrounding area. While many churches have either temporary canvas labyrinths or more permanent installations, it is important to have labyrinths in public, secular settings. In a neutral space such as a public park, diverse groups are more likely to come together and share this powerful experience, providing opportunities for community engagement and healing. Therefore, the labyrinth and surrounding environment should not contain symbols or attempt an interpretation to insure that no one feels excluded. Individuals are then able to bring their own interpretation and meaning to the labyrinth experience. However, community labyrinths can be an opportunity to address community issues. An investment in labyrinths could potentially impact economic development. Features such as the labyrinth fit right into retaining and attracting creative talent, along with enlivening the area in which they are offered and providing an unusual and interesting centerpiece for community events. Creative workers and leaders from business and the non-profit sectors must work together to build the caring and learning communities needed today. When the labyrinth is utilized intentionally as a tool for harnessing the creative power of individuals, organizations, and institutions, who knows what the ripple effect can be for the community at large. Labyrinths can be part of a community engagement initiative to bring leaders together from many different sectors (such as business, non-profits, educational institutions, etc.). Widespread adoption of labyrinths as tools for personal and organizational development could ultimately impact the creative output of an entire community. As tools for creativity, team-building, and problem-solving, labyrinths can be used to cultivate the creative and cultural capital of a community, enhancing innovation and promoting a strong economy. Labyrinths are contemplative tools for reflection and introspection that need to be in a serene, natural environment to be effective. The walker needs a feeling of peace and tranquility, as well as a sense of safety and refuge. There should be few distractions so that the surroundings do not detract from the labyrinth experience. Since the walker is reflecting and not completely aware of their surroundings, they should not be too isolated from others or out of view. They should be away from heavy traffic and active/noisy sports, but should not be isolated since safety is an issue. An indoor labyrinth or one covered by a pavilion allows people to walk in cold or rainy weather and provides safety in the evening, more accessibility to those handicapped, and potentially rental income. An indoor facility can be designated by the community and rented for use by groups for workshops, retreats, or weddings. Robert Ferré discusses some of the considerations in his booklet, Planning for Labyrinths: Design Considerations and Guidelines for Architects and Building Committees. [While this booklet focuses on hospital and church installations, much of it equally applies to parks. Some of the simpler installations can be done with volunteers advising park staff or contractors. But if the park selects one of the more involved, expensive installations using concrete, pavers, or stone, we recommend using an experienced labyrinth builder. Community labyrinths can be funded through partnerships with organizations seeking ways to make the public more aware of community issues and encourage community participation in the creation of the labyrinth. A labyrinth could be a memorial to peace, veterans, tolerance, cancer survivors, or victims of violence where individuals “buy a brick.” The Columbine Peace Labyrinth in Littleton, Colorado, is an example of a memorial labyrinth. Labyrinth installations can also be an art project. The National Endowment for the Arts (NEA) has funded labyrinths as design arts projects where artists, landscape architects, and the community collaborate to create an environment. Labyrinths can be an exciting part of a trail of contemplative spaces linking public gardens and other sites and promoted by the Convention and Visitors Bureau. Only a few labyrinths are in public parks. Note that some are maintained by other organizations. We have identified some of the labyrinths available in public parks in the United States below. To search for more, please visit the World Wide Labyrinth Locator. We hope that more communities will consider including labyrinths in public parks as part of their public recreational strategies. For more information, contact Margaret Saizan. Don’t forget the all important benefit your labyrinth will provide you and your employees ….for when the day is over, or before it begins, the peace and tranquility of the labyrinth is there waiting for those intimate moments when no one else is around. Successful retreat centers, be they small or large, meet the needs and challenges faced by the people who are drawn to them and there is much to be gained from the addition of a labyrinth in your retreat space….both for you and yours on a personal as well as business level and of course the lucky ones that visit and share that space with you and your labyrinth. Aside from the obvious benefits a labyrinth can provide a retreat space, many new labyrinth lovers can be spawned from one single personal experience. You may never be fully aware of how many circumstances of “paying it forward” may be the result of one persons experience on your labyrinth. Many special programs can be developed around the labyrinth, allowing you to find an abundant array of ways to serve the needs of your community and guests. Local charities are marvelous benefactors when fund raisers are held utilizing the labyrinth along with some wonderful exposure for your retreat center as an added bonus. The amount you spend on your labyrinth can run from a little to a lot and depends largely on what your budget will allow. There are excellent sources for new canvas labyrinths in a variety of sizes and design options; you may also be able to find a good used one in the size you are looking for . Canvas is a good option if you want to use indoor space for more than one function…dining hall by day, labyrinth hall by night. Canvas is also a good option for outdoor use; however, it cannot remain outside and does have some challenges when it comes to cleaning and storage. Permanent labyrinths can be constructed in a large array of materials; brick pavers, painted concrete (some with radiant heating for walking during winter months), natural stone or rock, naturally lined pathways with herbs or shrubs…the list is endless and here again are in direct relation to the cost. Seed patterns are a great way to “do it yourself” and enlisting some volunteers for a labyrinth building project is the best way to save money. A good rule of thumb to ensure success and completion of your project is to remember that the larger the labyrinth and the more complicated the construction material, the longer and more costly the project will become. Determining the labyrinth design you desire along with the location you have in mind for its placement, is directly related to the space you will need to allocate for your labyrinth. The Chartres replica design is a full eleven circuit labyrinth which is laid out utilizing sacred geometry and will require over 40’ diameter for an accurate replica, while the classical labyrinth is more flexible and simplistic in its design. The classical design is perfect for you if you are limited in space, funds to build, or manpower to get the job done. The flexibility of the classical allows for the creation of a 3-5 or 7 circuit labyrinth and can be easily assembled utilizing a number of “on hand” items not to mention some very creative ones such as irrigation flags, string, sports field paint, etc. Keep in mind that the smaller the diameter of the labyrinth, the narrower the paths…this will be especially critical when considering handicap accessibility concerns. Is your facility petite or a mega center? How many people do you host at any one time? Is the center geared toward your own work or do you look to attract outside facilitators? Is your center secular or non-secular? Will the labyrinth be used for ceremonies & workshops or provide repose for casual walkers? Is your center for profit or not for profit? These and many more questions may help you in the decision making process. We know that labyrinths have blossomed in schools, colleges, and universities across the United States in recent years. On the record as of March, 2016, there are 383 labyrinths located in schools or other educational centers in 39 countries listed in the World Wide Locator. No doubt there are many around the world that aren’t listed. The ones that are listed vary as much as do labyrinths in general. The labyrinths in educational settings vary in size, type, material, and location, whether indoors or out. The commonality is that the labyrinths are used in educational settings, and at least in part, for educational purposes. Labyrinths and labyrinth activities are easily adapted for populations of any age, and schools, colleges, and universities utilize activities for personal growth, self-discovery, community building, conflict resolution, and recreation. Labyrinths are an attractive and useful addition to campuses around the world. Why are labyrinths thriving in schools? Children respond immediately to the pattern of a labyrinth. Of course, they first want to race to the middle and out again as fast as they can, but with training they can also use it for such things as dealing with grief, problem solving, conflict resolution, building community and celebrating joyful events. 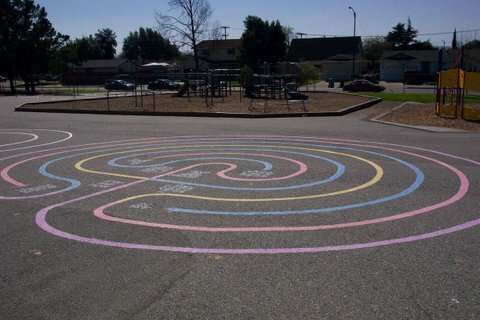 Many teachers have found ways to use the labyrinth to enrich learning experiences. There are many TLS members working with children and labyrinths. Some of those have summarized their work below. They would welcome questions and comments about their work. I am an artist and coordinated a Finger Labyrinth project for an art enrichment program in elementary schools in the South Bay of Los Angeles. The labyrinths were made out of air-drying clay and painted. The lower grades made spiraling designs - snails, hearts, waves, etc. The upper grades learned how to create a Cretan Labyrinth using the seed pattern. This project informed 4,000 children about the labyrinth. For more info contact Annemarie Rawlinson. Through the national non-profit organization, Living Labyrinths for Peace, Inc., Sandra Wasko-Flood has conducted workshops in over 50 schools in the Washington, DC area sponsored by the Washington Performing Arts Society (WPAS), and more recently, in the Baltimore, MD and Taos, NM schools. Students walk labyrinths to find a path to themselves, to stimulate creativity, express wishes, make decisions, and resolve conflicts. Through posters and diagrams, they learn labyrinth vocabulary, and create Labyrinth Books with designs in many media. Together with their classmates, they can paint a 12-foot square canvas labyrinth and/or one outdoors dedicated to the children of their school. Here they celebrate important events in their lives and those of their communities. They walk labyrinths making peace wishes for themselves, family, friends, community, and the world. 410-243-1189 (home) or 703-217-6706 (cell). While a teacher at Lower Southampton Elementary School in Feasterville, PA. I facilitated an annual Peace Week. Featured along with many other activities, students were trained in using the "Peace Maze," a rainbow colored seven circuit labyrinth. The labyrinth was painted on the playground and displayed the language of conflict resolution at each turn. Since then, I have duplicated the "Peace Maze in the other elementary schools in the district as well as schools in other states. For more info contact Connie Fenty and visit the Your Nature Connection website. I work in culturally and educationally challenged environments, and with special needs children using single and double-labyrinth exercises to help children touch their creative sides, and stimulate their imaginations. I will partner with any existing group that works with children in an inner city or Reservation environment to integrate their culture into the use of labyrinths. I provide guidance and mentoring also, for the adults and teachers, on how to use the labyrinth to encourage and stimulate the children’s needs for exercise of the body and mind, and for them to develop innovative programs, advocating the building of walkable labyrinths on playgrounds for recess, and distributing labyrinth patterns for their free time, for tracing with their fingers. For more information, contact Virginia LoneSky or visit the Peaceful Endeavours website. Kindergarten through Adult: I have had the extraordinary opportunity to present the labyrinth in a variety of schools in Las Vegas -- a Muslim school, a high-risk adult school, private and parochial schools and inner-city schools. I would be happy to discuss my presentation, the interesting teacher/student reactions and the resulting long-term labyrinth activities. For this and information on how to take your labyrinth program into schools, contact Gael Hancock. Montessori schools are among the many schools adding labyrinths to their outdoor and indoor environments. Walking or using a labyrinth is very “Montessori”—it’s a self-correcting lesson in concentration! Montessorians consciously incorporate peace education in the curriculum and encourage children to grow internally. The labyrinth can be a valuable tool in all those things—whether helping a child regain self-control, friends working through a problem, a group celebrating community or as a place for active self-discovery for an individual. Many classrooms have a finger labyrinth on a “Peace Table” that is used for calming, reflection, or just for the intrinsic fun of “walking the labyrinth.” Incorporating labyrinths in ceremonies or rituals and using them for special occasions is appropriate for any school, Montessori or not! M.E. (Beth) Langley has been presenting at Montessori conferences on the subject of labyrinths and designing and installing labyrinths (many at Montessori schools) since 2006. Her website at www.LastingLabyrinths.com includes photos, resources and links to follow for labyrinth exploration. She has written a Montessori-style presentation on labyrinths and included it on the Files for Sharing page. Beth loves to consult with individuals and groups to create unique labyrinths and labyrinth experiences for groups of any size. You can contact her by e-mailing Beth Langley. This section of 'Labyrinths in Use' presents the creation and use of labyrinths in Higher Education. Written from an international perspective, it includes labyrinths in North America, Asia, Australasia, and Europe. As the primary author of this section is British, please note that the word staff is used in the British sense, inclusive of faculty and other colleagues. Since the turn of the century, many permanent labyrinths have been created in university and college settings. Sometimes these are built specifically to enhance the campus environment as beautiful landscape features, and sometimes as memorials or as part of a Chaplaincy initiative. There are now exciting developments in wider use of permanent or ephemeral labyrinths on campus - and also in city universities that do not identify as campus-based. Labyrinths are being used in different, creative ways, within and beyond academic disciplines: as part of teaching and learning, for staff and student development, and as the topic of research or to support the research process. The labyrinth is a powerful and beautiful resource that can become wellsprings of quietness and peace in our universities and colleges, and for the wider community. The growing interest in labyrinths in academic contexts shows no sign of abating: we invite you to explore these pages, to share your own ideas and - not least - to record and write about your findings and experiences. This field is under-researched and the possibilities are wide-ranging. For more on this, see the closing webpage in this section, and The Labyrinth Society's call for researchers on this website. If you are looking for a particular university labyrinth, or any labyrinths associated with universities, please visit the World Wide Labyrinth Locator. You can filter your search by using the key words 'university' or 'college', though some of these are churches or medical centres associated with, or near, a university. For a broader search, use the filter for 'School or Educational Centre'. Prepared for the Labyrinth Society by Jan Sellers, lead editor of Learning with the Labyrinth: Creating reflective space in higher education (Sellers and Moss, 2016). Web pages revised 2018 by Jan Sellers, Jodi Lorimer, and Diane Rudebock. We will be glad to hear from you: please visit the Research area of the TLS website or Jan Sellers' website. Broadly speaking, there are five options, with some overlap between these. 1. A temporary, portable labyrinth such as a canvas that can be spread out on the floor. They may be made professionally (see TLS Marketplace for examples) or made by a team of volunteers - not necessarily with a professional finish, but such labours of love can be much appreciated. 2. A permanent labyrinth. These vary from fully paved installations to labyrinths that have a lighter impact on the environment and may overlap with the 'ephemeral' category below. 3. An ephemeral labyrinth, short-term or otherwise, that may draw on local materials and does not involve permanent paving. This can be as simple as a labyrinth mown in grass, laid out with rope or marked with surveyor paint. 'Found materials' can be used indoors and outdoors, and tape is also a good solution indoors. The Labyrinth Society provides advice on drawing classical and medieval labyrinths. 4. Finger labyrinths. Also known as table-top labyrinths, these may be permanently fixed in place (often near a permanent outdoor labyrinth) or may be hand-held or used at a desk or in other classroom situations. They are especially useful for people with mobility difficulties; for classroom settings when a walkable labyrinth is not an option; and as a means to enhance a labyrinth walk event. Choices include precisely cut wood labyrinths; labyrinth patterns on small pieces of cloth; and paper labyrinths which may be laminated. There are numerous sources for these. Students may also be interested in making their own finger labyrinths. 5. Other labyrinths, labyrinths that defy definition and remind us how creatively the concept of the labyrinth can be used. How can one introduce and use a labyrinth in teaching and learning, in counselling and wellbeing, in a university setting? Think of those times when stillness, slowing down, quietness, deepening reflection, will be valuable. There is a mental and emotional sense of stillness and quietness that can be gained through a walking meditation; the labyrinth is recognised as a helpful resource in the developing field of contemplative pedagogy in HE. The labyrinth is a powerful metaphor for life's journey: key turning points in university life, from induction to graduation, become opportunities for reflection through a labyrinth walk. It is notable how colleagues within specific disciplines and development teams, once they have experienced the labyrinth, may draw on labyrinth walking in ways that relate directly to their students' experience. This is explored with a wide range of examples in Learning with the Labyrinth: Creating Reflective Space for Higher Education (Jan Sellers and Bernard Moss, eds, 2016). The following examples show the sheer breadth of possibilities. These include examples from around the world, including the building of labyrinths; the inspiration behind them and their introduction in different academic disciplines. Some of these projects were initiated by students, others by staff; some cross boundaries, involving collaboration across disciplines or with other university teams. A labyrinth walk can provide an imaginative and reflective experience for conferences and training events. At Liverpool John Moores University, labyrinth walking is amongst the reflective resources used within the University from time to time: examples include business management development and an in-house academic development conference. See Alex Irving’s article, Creative Interventions with a Labyrinth (2017). Labyrinths as a beautiful design, enhancing the campus: sometimes linked to departments of Horticulture or Art, and sometimes to medical centres, chaplaincies or other centres and services. The University of Adelaide's Waite Arboretum Labyrinth (Australia) is created from locally sourced wood from within the Arboretum. Students have worked with the labyrinth image, constructing a labyrinth as part of their project or with exhibitions to accompany a labyrinth event. Some universities have labyrinths created through an artist-in-residence project. The Royal College of Art, (London, England) used art as outreach with school students, drawing on artist Mark Wallinger's labyrinth installations on the London Underground. It may be feasible to include a labyrinth as part of a major re-think of the design and layout of the campus, or of a significant element of the campus. Examples include the massive, public work of art by Guttorm Guttormsgaard at UiT, the Arctic University of Norway, Tromsø. Labyrinth walks held, once a month or at other intervals, as a quiet reflective space in the busy-ness of university life; labyrinth events to support and bring the university community together; labyrinths for solitary prayer and meditation. Examples include Bishop's University Interfaith Ministry, Lennoxville, Quebec, Canada, and the Indian Institute of Technology Bombay, Mumbai, with a labyrinth in the grounds of the Shri Devi Padmavati Temple. In this example at the University of Massachusetts Amherst (USA), a green labyrinth was created at a local prison through collaboration with the School of Nursing and the the Department of Landscape Architecture and Regional Planning. In the midst of earthquake ruins, students and staff at the University of Canterbury, Christchurch, New Zealand, set time aside to make 'something special for the community,' in collaboration with St. Luke's in the City. For students and staff, including Health Studies, support services, and staff development events (for work with counselling clients, see the Labyrinth Society web page on ‘Labyrinths in Counselling’). At the University of Worcester, England, the labyrinth is part of the 'Fit 4 Life: Relax Well' programme. For a comprehensive introduction to use of the labyrinth in English (and other) university departments, see Ronald J. Nelson's article on his work at James Madison University (Harrison, Virginia, USA). See also the creation of the Arboretum Labyrinth at JMU. The labyrinth is an interesting resource for mathematics teaching at all levels. For example, see Christopher Budd and Christopher Sangwin's intriguing chapter on labyrinths and mazes in: Mathematics Galore! Masterclasses, workshops and team projects in mathematics and its applications, New York: Oxford University Press (2000). A number of labyrinths have been funded by alumni in memory of, or in honour of, a relative or colleague at the university. Temple University's labyrinth, in the Ernesta Ballard Healing Garden (Ambler, Pennsylvania), honours a pioneering agriculturalist and feminist. The Chaplain at La Trobe and Charles Sturt Universities, Albury-Wondonga campus (New South Wales, Australia) has worked with the labyrinth to introduce mindfulness practice. An article exploring this was first published in the Australian Labyrinth Network Newsletter, issue 3: Spring 2015, and is available here by kind consent of Tina Christensen, Judy Redman, and the Australian Labyrinth Network: Mindfulness Practice and the Labyrinth Experience in a University Setting (.pdf 744K). Jill Geoffrion has taught with the labyrinth in Peace Studies, Theology, pastoral training, and conflict resolution. She discusses her work in an article about teaching and learning at the Peace Studies Center, Kangon Seminary, Myanmar. Building a permanent labyrinth at a university – and probably any public space – is likely to be the result of partnerships between sections of the organization that don’t often work together. This collaboration strengthens the project process (at the same time, making it more challenging) and therefore has the potential to strengthen relationships within the university in the longer term, a very positive benefit for labyrinth building and any complex project. The labyrinth as a resource for teaching and learning. Robert Ferré’s comprehensive overview of reasons to build a university labyrinth. In the UK at the University of Kent, in south-east England, the labyrinth project began in 2007 as part of Dr. Jan Sellers' National Teaching Fellowship project, exploring aspects of reflection and creativity in student learning development. It later became part of the University's ongoing Creative Campus initiative. An inter-disciplinary labyrinth group was set up, including student representation. 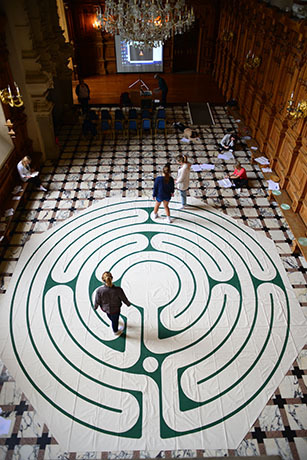 Following initial research, the project drew on Fellowship funds to purchase a canvas labyrinth, having negotiated for a space to offer labyrinth walks. Interest amongst students and staff grew to such an extent that the University decided to install a permanent labyrinth as a resource for teaching and learning. Designed by Jeff Saward in collaboration with Andrew Wiggins, and completed August 2008, the Canterbury Labyrinth is also a wonderful work of art and has been used as a performance space for student-led theatre groups. In seeking and building support for the building of a permanent labyrinth, there were some key factors that proved especially significant. (There is of course an element of subjectivity here; people with different roles within the University might list these differently). Aesthetics. The labyrinth is a notable enhancement to the landscape – and the university environment. Authority. The proposal went through appropriate formal channels and was supported by very senior colleagues. Collaboration. The initiative has drawn together colleagues from very different sections of the University, and this breadth of support has been a critical factor. Community. The new labyrinth has the potential to make a significant contribution to relationships between the City and the University. Creativity. Kent rightly prides itself on being a creative university, and this is certainly a creative initiative. Expertise. When we began to explore the idea – very tentatively – we found a highly respected team, ready to hand. Jeff Saward (researcher and designer) and Andrew Wiggins (Director of Haywood Landscapes) were developing a labyrinth for a local hospice and were available for a new project. Incentive. Senior (and other) colleagues very much wanted to have the labyrinth ready in time for the Lambeth Conference, an international gathering of the world-wide Anglican community taking place every ten years. This desire for speed was valuable in accelerating the internal, practical measures and the decisions needed, once the go-ahead had been given in principle. Innovation. Few universities - and none that I could find, in 2008 - have built a labyrinth specifically to support teaching and learning across the institution. Universities like to be innovative! The prospect of a possible ‘first’ gave significant impetus. Ownership. It was crucial, with this initiative, that a well-established team within the University was committed and enthusiastic. At Kent, this was the University’s Unit for the Enhancement of Learning and Teaching, where the Labyrinth Project is based. The project was then drawn into the newly evolving Creative Campus initiative, a natural home for it. Timeliness. The labyrinth provides a quiet time and space for reflection, much needed in a university life that feels increasingly pressured. There is a sense of the labyrinth being needed in this respect. Universality. The labyrinth, with a history going back at least 3,500 years and a presence in many faith and cultural traditions, is truly a resource for the whole community – particularly important in a diverse, contemporary and secular university. ‘Rightness’. It’s hard to define this, but it seems right to say that the support for the initiative was overwhelming. People at all levels in the university came to feel that this was a good and achievable idea: something that was right for this university. With research as a central focus of university life, it’s not surprising to find labyrinths as the subject of research. For more information on this, see the Labyrinth Society's research pages and research bibliography. We encourage you to write about your experiences and to share them within your own field and more widely. Research enquiries? Please contact The Labyrinth Society's Research Committee. Looking for an opportunity for presenting papers and posters - and meeting many labyrinth enthusiasts? See The Labyrinth Society's Annual Gathering page. The breadth of research in relation to the labyrinth is considerable. Fields of interest include archaeology and history; physiology and healing; anger and stress management; the labyrinth in literature; spiritual development and the arts; the labyrinth in learning and teaching; and more. If you are considering a research project, there are real opportunities to contribute to knowledge and understanding in this field. If you are establishing a labyrinth project at your own university or college, you may well be asked about evidence to support your proposal, and for examples of innovative practice in this respect. Learning with the Labyrinth: Creating Reflective Space in Higher Education is a helpful publication in this regard, with 30 contributors reflecting on labyrinth work in their own, very diverse university settings, ranging from Creative Writing to Midwifery and from Counselling to Career Development (Jan Sellers and Bernard Moss, eds, 2016). As a starting point, the first chapter provides an overview of the contemporary interest in the labyrinth as a teaching and learning resource, including a brief review of the literature on teaching and learning with the labyrinth. Sellers, Jan and Moss, Bernard, eds. (2016). Learning with the Labyrinth: Creating Reflective Space in Higher Education. Palgrave: London and New York. This independent journal is published annually, edited by Jeff and Kimberly Saward. The journal acts as a forum for historical and theoretical research, the publication of archive material and as a monitor of current developments with the field (Saward and Saward, 2018). Caerdroia web pages include archived contents pages and a generous range of freely downloadable articles from previous editions. The editors welcome enquiries about contributions to the Journal. Can Walking a Labyrinth Help Tech-Savvy College Students Connect?